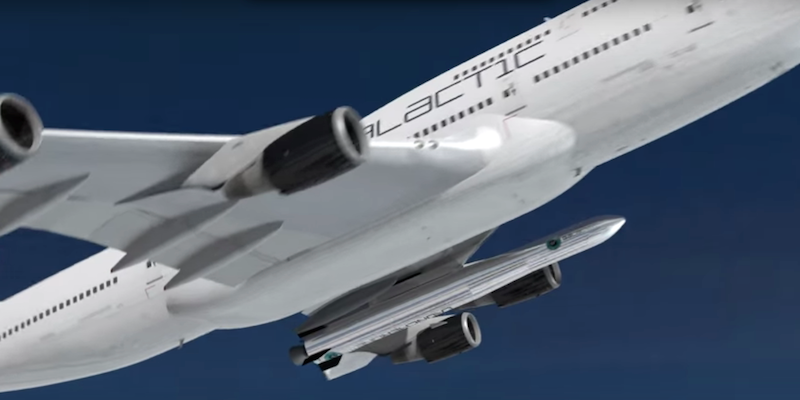 Space cowboy Richard Branson and his company, Virgin Galactic, showed off a 747-400 airplane that could launch rocket payloads from the air straight into orbit. The mothership, a.k.a “Cosmic Girl,” would carry Virgin Galactic’s LauncherOne rockets to new heights. In concept, using a modified commercial airplane as a rocket-carrier negates the need for a ground launch pad and all of its attendant logistics. Instead, the rocket is bound to the plane’s wing, and after reaching an altitude of 35,000 feet on its hitched ride, it can disengage, fire up its engine, and continue its mission to deposit a satellite payload into orbit. Cosmic Girl, which has been in the Virgin fleet as a commercial aircraft since 2001, is set to undergo quite the transformation, per Virgin’s press release: “the LauncherOne rocket will be mounted to the carrier aircraft under the left wing, adjacent to the position that has been used by other 747s to ferry a fifth engine.” The rocket weighs about 55,000 pounds. Virgin already has signed a $4.7 million contract with NASA to launch more than a dozen experimental satellites on a test flight. And it also has a deal with OneWeb, which plans to build a global Internet satellite system, for 39 satellites with an option for 100 more. Branson talked up the quick satellite turnaround time that using a plane launch would make possible. “If you’re waiting for one of these giant rockets to put small satellites into space, you sometimes have to wait six months, or a year,” he said at the Cosmic Girl event. By contrast, a Virgin Galactic mothership could theoretically be good to go with 24 hours of notice. The payoffs could be huge. Branson says he wants to use the LauncherOne rocket and satellite systems to help extend Internet and communication services to unconnected communities. This would mean creating new markets for Virgin, of course, but it’s also a laudable humanitarian goal. And Virgin announced in September that it will increase the payload weight that LauncherOne can handle, which would put it into competition for insanely lucrative government satellite launch contracts—like the ones that SpaceX have been going after for so long. A similar mode of “air launch” is also the mechanism behind flying Virgin Galactic’s SpaceShipTwo, the long-simmering experimental craft designed to ferry space-loving tourists. SpaceShipTwo crashed last year in testing, resulting in the death of a pilot, and Virgin is at work on a new craft. But with the addition of Cosmic Girl to the air launch fleet, Virgin’s satellite plans can continue to evolve, independent of SpaceShipTwo’s shadow.